If you want to be a god (or a wizard, take your pick), you have to be able to manipulate reality at the quantum level. This allows you to walk on water, through walls, and into time dimensions. You can levitate, annihilate, generate, and manipulate any and all forms of matter. This is what gods and wizards do. This is their job description. Basically, when you can control particles while they are in-between states of existences, you have uncracked the code of reality in time-space. This is very much worthy of a Nobel prize, and that Nobel prize has been granted to two scientists in accordance with the value of the discovery, Serge Haroche and David J. Wineland. As has been discovered, “…the motion inside the atom is already going at the speed of light, or very close to it—so it doesn’t take much to finish the job.” ~ David Wilcock. This is what the two scientists have successfully been able to do in a scientifically reproducible manner. When matter is cooled, it gains coherency and retains its particle-like nature–likewise, when it heats up, it loses coherency and retains its wave-like nature. Since we live in the ‘particle’ world, so to speak, we have to cool the ion down a bit so that it stays on our side of reality long enough for us to manipulate it. David Wineland isolated the ion by suppressing its thermal motion by cooling it down. Then, he used a carefully tuned laser pulse to nudge it into place. 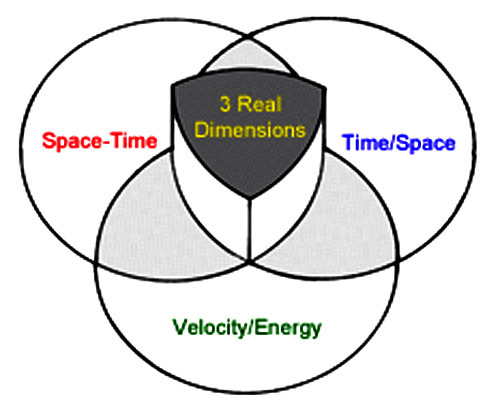 The ‘place’ we are talking about is precisely the half-way point between space-time and time-space, where the particle exists both as a wave and as a particle*. This midway region has been a huge source of contention between many scientists because it has heretofore been so elusive and impossible to pin down. When it occupies two different energy levels simultaneously, we can look at it, and it won’t change states on us and it won’t disappear. It would then be quantifiable, a state that is highly desired in our scientific world, where measurements and reproducible experiments are the rigid standard rules. Serge Haroche used a different method to calculate the same effect. Instead of trapping the ion so that it stays in between the two realms, he used velocity to isolate the photons by bouncing them between two mirrors. This single photon bounces back and forth between the two mirrors at a speed of 40,000 kilometers per tenth of a second. At this speed, the photon could circle around the earth at a tenth of a second, which is still very fast, but not so fast that it could not be measured. If we look at the chart, Haroche utilized the velocity/energy side to reach the ion. So what does this have to do with the ordinary people on this side of space-time? Everything. We have all seen how computers have changed our lives and our civilization. Now imagine its effects quadrupled. This is the huge promise of quantum computing, and it is coming in the very near future. This is how it works.